The third conditional is the most feared grammar point I know. Students of English think that it’s hard to form and understand. Therefore, when they start learning the grammar they are paralysed with fear. And as a result, they fail to learn it. Thus the third conditional keeps its reputation. But the truth is that the third conditional is not difficult at all. In this post I will show you how to teach this grammar quickly. I hope to destroy the myth that the third conditional is difficult. Display the following infographic or print out copies and hand them out. Draw the students´ attention to the form. Next, explain the meaning of the third conditional. Tell your students that the if-clause of the conditional speaks about a situation in the past that did not happen. The second part of the sentence expresses our hypothesis about what could have happened if the first part of the sentence were true. In both parts we speak about the past, and none of the actions happened. The ideas expressed in the third conditional are about the past and they never happened. Now, ask your students to form three third conditional sentences using the clues in the infographic and to describe the situations in which they might be used. For example: Martina went to a party yesterday. She got drunk and the police arrested her. If she had stayed at home, nothing of this would have happened. The following quiz can help your students practise the third conditional either at school or at home. The quiz consists of two parts. 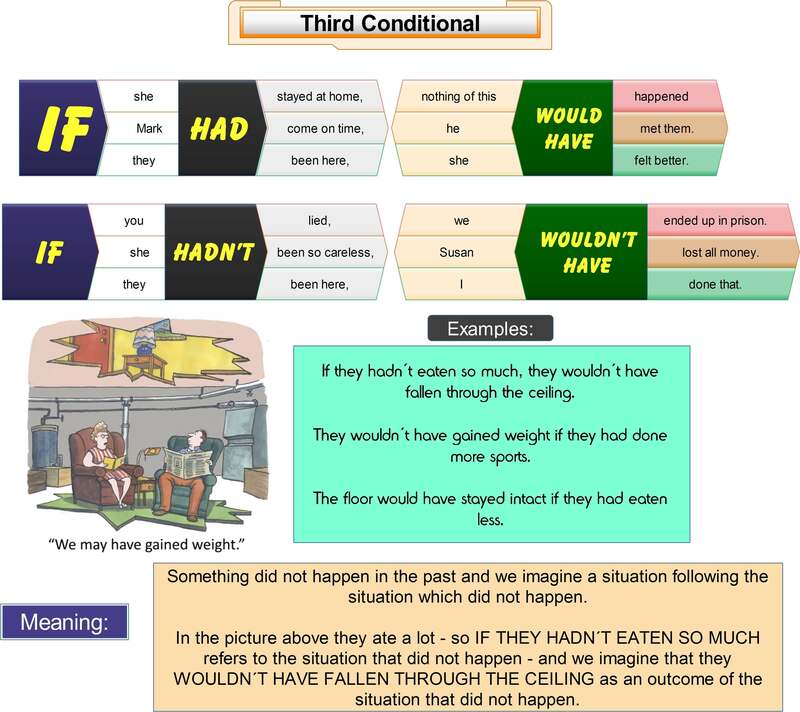 In the first part, students should match the beginnings and ends of the third conditional sentences. In the second part, students have to put the verbs into the correct form to form the third conditionals. The students will be rewarded with a game after each part of the quiz they pass. The quiz is in HTML5, so it will play on all desktops and mobile devices.